There is a pious story about St. Augustine walking along a beach one day pondering and reflecting on the Trinity. He encounters a young child digging a hole in the sand. Repeatedly, the child walks to the ocean, fills a small pail with water, and returns to the hole where he dumps the water. When asked by St. Augustine what he is doing, the child casually explains that he is putting the ocean into the hole. St. Augustine laughs and tells the child he could never do such a thing in a million years. The child tells St. Augustine that neither could he ever understand the Trinity on which he is reflecting. And yet, salvation history is full of evidence regarding the desire of God to be known and the love of God which desires a relationship with every human person. Obviously, we cannot know the fullness of God, as we will spend eternity entering more deeply into the very mystery of God. But God does want to be known. We cannot know the mind and heart of God, but we are invited into his heart none-the-less. God entered into covenants of various natures, with Abraham, with Noah, and the great covenant established when God gave the Ten Commandments to Moses. Finally, the New and Eternal Covenant began with the Incarnation. The Invisible God, the Infinite God took upon himself our human condition, and became one of us in all things except sin, and the Son of God, Jesus was born from a Virgin. The doctrine of the Trinity tells us that God is a relationship of Love within himself. 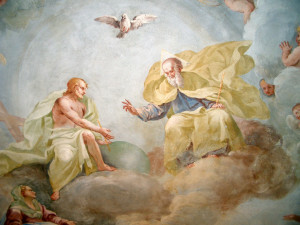 The Father loves the Son, and the Son loves the Father, and the Holy Spirit is the Love between the Father and the Son. That simply truth challenges our human minds, but it tells us that relationship is critical for those of us who want to know God. It tells us that God desires a relationship with us, and that it is possible to be in relationship with God. It also tells us that our human relationships are to reflect God, and the manner in which our relationships reflect God is when we love one another. Think about whom you know best, and who knows you best, and then you will begin to see the role love plays. I would propose that spouses know each other better than any other two people. Granted this does not hold true for all spouses – but it should. The reason for this is the love share between the two. How well does a parent know a child? And why, because of the love that wants to do everything possible for their well-being. Finally, friendship leads to a deep knowledge of another, and again, because love desires what is good for another. Relationships of love are a revelation of God because they participate in the love of God. Relationships of love are a doorway for God to enter into the world, and the best practice for advancing the Kingdom of God in this life. There is so much concern among people of faith today that society is pushing God further and further from the public square. I would agree, but perhaps not for the same reason as first comes to mind for many. When we speak of this reality of secularism – pushing God out of the public arena, we think first about the political and philosophical realities that are at work. As serious as these threats are to the Christian values we hold dear – I would propose that the primary way in which God’s presence in our society is threatened is the manner in which we treat one another. There is a fundamental lack of love in the world, and where love is lacking, so is God’s presence. There is one simple way for us to keep God in the public square – by keeping God in our lives – by loving one another. Let us make a simple act of faith or two this morning. First of all, let us recognize that God desires to have a relationship with us. Let us make an act of faith that it is possible to have a relationship with God. For us as Christians, our relationship with God is through his Son, Jesus Christ. Let us also acknowledge in faith that yes we are sinners, but, even in our sinfulness we are still loved by God. That is what the death and resurrection of Jesus tells us. We are loved beyond our wildest dreams! God sent us his Son to reveal this love. Jesus gave us his life to reveal this love. Jesus sends us his Holy Spirit that this love of God may dwell always within our hearts. prev postWe Give Thanks, God Has Blessed Us With Another Priest. Congratulations, Fr. Andrew Kinstetter!